My latest PopMatters article is now live: Asymmetry and Android Netrunner. I love asymmetric games. Natural Selection 2, Left 4 Dead, even, to some extent, the unfortunately named F.3.A.R. play around with asymmetry in rules systems in wonderful ways. Asymmetry is still a rarity, but when it does crop up, I find it endlessly fascinating. There is something wholly and wonderfully special about asymmetry in games. This week on PopMatters, I try to suss out exactly what makes these games so special. Here's the problem: it's actually not that easy to do. See, plenty of multiplayer games, digital or analog, feature asymmetry, in a way, as a core mechanic. If you are a Pyro and I'm a Heavy in Team Fortress 2, we functionally play under a different set of rules. Hell, even chess could be considered asymmetric the moment one player loses his queen. When one player's affordances differ significantly from other, interesting dynamics emerse. But still, games like Android Netrunner differ somehow from this casual definition of asymmetry. After thinking over a variety of asymmetric rules systems, I settle on the "safe practice of lopsided power struggles" as a defining feature in asymmetric games. There are certainly more design factors that set these games apart from their compatriots and I'll undoubtedly give the subject more thought. In fact, I would love to hear your theories. What do you think makes asymmetric games uniquely compelling? 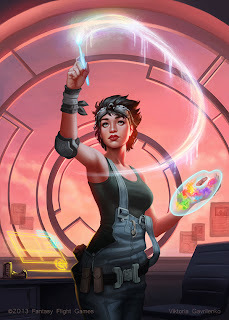 Asymmetry aside, there are a lot of reasons to enjoy Android Netrunner. For one, the theme resonates beautifully with the game mechanics. The systems also work together so wonderfully, so tightly, that I find myself awed at new cards, my mind racing with all the ways it can be combined with others to make really cool decks. Since I rarely have the opportunity to actually play the game, I have spent more time in the deck construction process than in actual matches. I especially enjoy the limitations to corporation use that forces you to be judicious and adaptable when designing a deck. Building a customized system that suits your play style is a thrilling process in its own right. In other words, you should seriously consider checking out Android Netrunner if you are given the chance. For admirers of well designed board game systems, Netrunner is one of the best.